Abraham Stewart was the eldest son of Abraham and Elizabeth Stewart. He was born on 29th July 1893 in Magherafelt. He was the first of thirteen children, ten surviving. The family lived in Aughagaskin, Magherafelt until about 1910. They then moved to Cookstown. Abraham joined the Special Reserve about 1910. 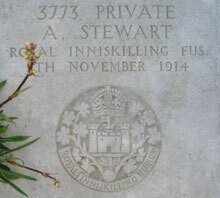 Private Stewart went to the Front with the first draft in October. 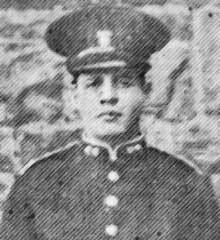 Private Abraham Stewart was serving with 2nd Battalion of the Royal Inniskilling Fusiliers when he died of wounds on Thursday 5th November 1914. 6 War Graves Photographic Project Gravestone photo of Private Abraham Stewart can be purchased here.